The big news from tonight is the Peter Capaldi’s introduction as the Twelfth Doctor. He should be replacing Matt Smith on Christmas special episode, when the Eleventh Doctor will regenerate from one reason or another. The future Time Lord was among the guests on tonight’s show – Doctor Who Live: The Twelfth Doctor – who also included guests as the fifth Doctor Peter Davison, fellow Who alumnus Bernard Cribbins and celebrity fans Daniel Roache, Rufus Hound and Liza Tarbuck. There were contributions, too, from Sixth Doctor Colin Baker, and former companions Anneke Wills, who played Polly, Katy Manning, aka Jo Grant, Janet Fielding, who was Tegan, and Bonnie Langford, known to fans as Mel. Well… there are 2 problems about this new Doctor. The actor Peter Capaldi appeared in both. So… In Torchwood the Doctor and Peter Capaldi’s character never met (as far as I remember), but David Tennant (the Tenth Doctor) saved Peter Capaldi’s character and family from the vulcano’s killer breath. it’s a hoax. A part of Steven Moffat’s lies, a trial to save the show and the surprises he’s preparing for us for the end of the year. it’s for real, and Steven Moffat will have some explaining to do. 😀 A very very very good reason why the new Doctor is identical to the previous characters. Do you remember Charles Dickens and the Unquiet Dead, the third episode from new series of Doctor Who?Â The TARDIS lands in Cardiff 1869. There The Doctor and Rose team up with none other than Charles Dickens as they deal with a funeral parlor where it seems that corpses have come to life. It is said that the BBC team loved Eve Myles (especially the writerÂ Russell T. Davies) so much in the role of the maid that they cast her in the spin-off of Doctor Who, Torchwood. I wasn’t looking for some running shoes (the Doctor runs a lot, isn’t it?) but I found some… I recently bought some shoes, I don’t need new ones but I consider buying the Doctor Who converse… just for show. 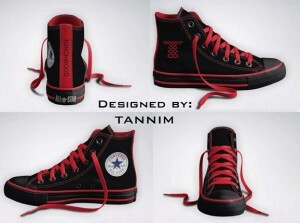 The shoes are the creation ofÂ Etsy user Tannim, you can order a pair for the a hundred bucks. 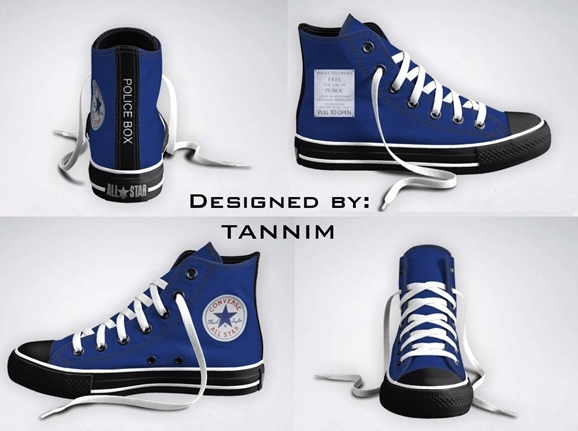 Colored the iconic TARDIS blue, the shoes have several nice touches such as the Police Box sign on the side. One thing that isnâ€™t clear: how you can figure out what size you need if theyâ€™re bigger on the inside than the outside. For the fans ofÂ TorchwoodÂ there are some Converse that fits your desire, even if that series doesnâ€™t really have any iconic visuals that are instantly associated with it. They are still pretty damn cool looking. Â John Barrowman (captain Jack Harkness in Doctor Who and Torchwood) answers fan questions during his Q&A panel at C2E2 in Chicago!